Darcy Gardiner is expected to miss six to eight weeks of pre-season following an injury at camp. After proving himself a "competitive beast" at junior level, key backman Darcy Gardiner arrived in Brisbane eager to learn from one of the great defenders of the modern era, Justin Leppitsch. He is a 191cm full-back who is being groomed to eventually replace Daniel Merrett as the Lions' full back in the future. 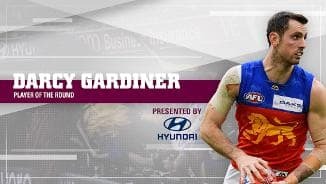 • Darcy Gardiner was widely rated as the best defender from the draft class of 2013, after performing key defensive roles on quality talls such as Jesse Hogan and eventual No.1 pick Tom Boyd, who later rated Gardiner as his toughest opponent. • He earned U18 All-Australian selection for his performances with VIC Metro at the National Championships, despite battling a niggling ankle injury. 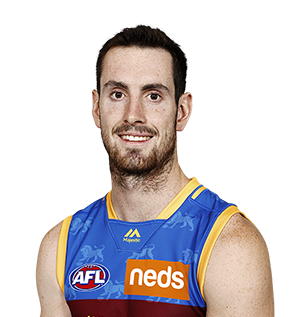 • With newly appointed Senior Coach Justin Leppitsch desperate to address the Lions' aging backline, it was no surprise to hear Gardiner's name read out with the Club's second selection (Pick No.22 overall) at the 2013 AFL National Draft. • Gardiner had a prominent season in the Senior side, playing all bar three AFL games. • Having earned a reputation as the ‘competitive beast’ after being awarded the Shaun Hart award for the Club’s Most Competitive Player in 2016, the tall defender had a status to fulfil. • Despite suffering from a dislocated elbow during the Round 15 victory over Essendon, Gardiner made a return by Round 18 and finished his season on a high. • The 20-year-old defender impressed throughout the year despite injury setbacks which saw him sidelined for three games after Round 8 against Collingwood. • The 191cm tall earned a reputation as a ‘competitive beast’ at junior level, an attitude which has followed him till now as he took home the 2016 Shaun Hart award for Most Competitive Player at the Club Champion night. 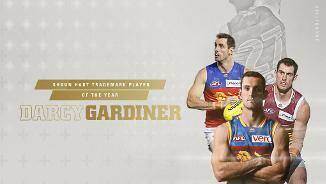 • Gardiner had his best year to date at the football club, finishing in the top ten in the Club's Best and Fairest. • Defender Darcy Gardiner played eight games for the Lions this season as he struggled initially with injury. • The 20 year-old eventually succumbed to injury again – being ruled out for the season due to an injured shoulder and ankle requiring surgery. • As he continues his development in 2016, Gardiner will form an integral place in the Lions’ back six. • The Lions selected key defender Darcy Gardiner and lightning quick midfielder Lewis Taylor, both from the Geelong Falcons, in the 2013 NAB AFL Draft. 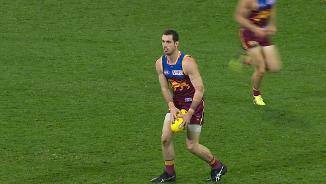 • Gardiner played superb football and played a key role in the Lions' scrappy 23-point win over Melbourne. The back man took a career-high, 12 marks against Jack Watts, Chris Dawes and James Frawley. • During this game, Gardiner also collected 18 possessions – which he used at an elite 94 per cent efficiency – to earn the Rising Star gong. • He finished the season with 17 senior games, kicking 2 goals and averaging 11.3 disposals for the season.